Home » Why Choose Quality? Don’t compromise safety standards of your business! The material handling industry plays a huge role in making day to day operations go smoothly for companies around the world. When purchasing material handling equipment and services, working with the right people makes all the difference. You need a company that meets industry standards in quality and service! The Occupational Safety & Health Administration (OSHA) sets forth strict requirements and guidelines for health and safety compliance within the workplace. OSHA violations can result in thousands of dollars in hefty fines, road blocks for your business operations, and potential injuries to your employees and staff. According to OSHA statistics, approximately 1023 citations totaling $1,796,626 in fines were assessed between October 2014 and September 2015, in the Warehousing and Storage industry alone! Making sure your facility, equipment, and materials meet regulations can save you and your business a fortune in fines and costs associated with bringing your facility up to code. Hiring an expert team of licensed professionals is the first step toward minimizing or eliminating OSHA violations. Quality Material Handling has been in the industry since 1991 and understands the ins and outs of the business, and how to meet client expectations in everything from warehouse layout and design, detailed CAD drawings, pallet racking system installations, and permit processing and approvals. We only use premium steel for our products, and make sure the job gets done right! ❯ Expert permit preparation and submission – we get you approved! With over 25 years of experience, we have the knowledge and expertise you can trust to get the job done right the first time. We are licensed, insured, and certified specialists in the material handling industry, and as a well-established and growing company, our experience and expertise sets us ahead of our competitors. Our experience with warehouse systems and equipment helps us provide the best warehouse management solutions. We stand by the quality and durability of our products, and offer free consultations to figure out what you need to expand and/or maximize efficiency. From permit processing to installation & relocation, we do it all! As experienced professionals in material handling and services, we make sure we do everything correctly in a timely manner. Our focus is to provide a one-stop-shop to make the process as easy as possible for our customers. Quality Material Handling is here to be your warehouse solution partner and help your business grow. You Are Not Just a Client! Clients find that our pride and joy as a company is to partner with and be there for them as they grow their business. We don’t look at clients and see dollar signs – we focus on relationships. We have many loyal clients that have become friends over the years. As a family-run company, the values we uphold in our relationships carry over into our work. Before selecting a company for your material handling needs, it’s highly recommended that you research reputable companies and products in the industry. It’s important to question the quality and reputation of any business before beginning your project. The biggest tell-tale sign of poorly manufactured material handling products and racking systems is a significantly cheaper price. Shop for quotes tailored to your specific needs, and understand what you should be paying. This will make it easy for your to spot the “too good to be true” offers out there. The Bureau of Labor Statistics reports that in 2014, there were over 350 cases of injury or death specifically in the material handling industry! Your employees are at the core of your operations and success, and so making sure the materials and equipment in and around your facility are OSHA-compliant is the first step to ensuring their safety and success in the workplace. or fill out the form and a specialist will contact you promptly. 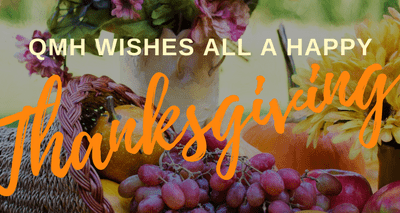 It is Thanksgiving week, and you’re probably already looking forward to spending the weekend gobbling down on delicious food with family and friends! But before we get to the weekend, let’s all remember to spend some time saying ‘thank you’ to all those who have helped you be where you are today. QMH, in collaboration with Faith Community Church, is proud to say that as a team we were able to put together 40 Thanksgiving Boxes which will be able to feed approximately 10 individuals per box this upcoming holiday! Wishing everyone a lovely and grateful Thanksgiving!